The program helps littles in grades K-5 learn common core standards. 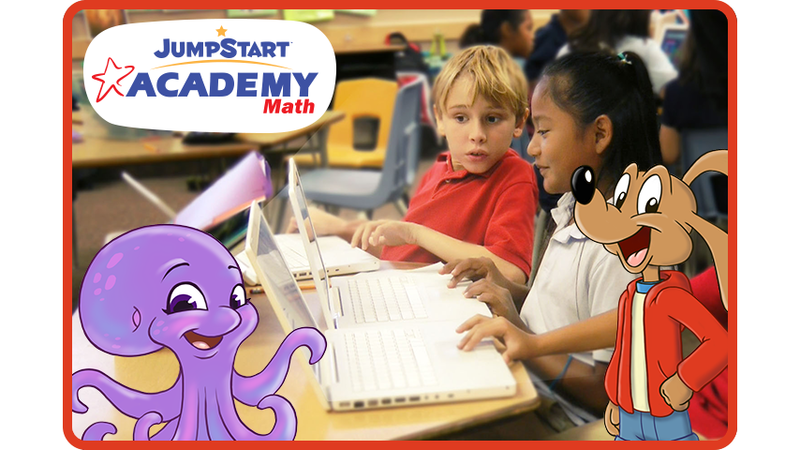 JumpStart, which creates educational games for kids, launched JumpStart Academy Math, a new online program for elementary schools that was designed to help kids at all skill levels learn math concepts through teacher-assigned lessons and multiplayer games. The program was designed for students in kindergarten through fifth grade. It includes four “pre-test assessments” that can be used to place each student in the proper curriculum level based on their results. From there, kids can complete practice levels on their own, or work together with other students in their classroom to complete over 300 game-based lessons focused on four different areas: measurements and data, geometry, fractions, and operations. Lessons can be completed on mobile devices, tablets, and PC. The program’s games can be played against other classes at the same school, or even classes at different schools, so long as they’re all using the JumpStart Academy Math program. As kids answer questions and complete lessons, teachers can view data showing each student’s answers and how much time they spent on each question, so they know which subjects students may need to work on going forward. JumpStart said its program is already being used by thousands of schools across the U.S. Parents, if you think your kids would benefit from this kind of learning program, encourage your kids’ teachers and other school faculty to consider bringing it to their schools. JumpStart’s games have been around for decades. Parents, you may have even played one of them when you were in school. For instance, games in the Math Blaster franchise have been used in classrooms for over 15 years. More recently, the company has released games based on popular brands, such as the Madagascar and How to Train Your Dragon film franchises.